I enjoyed the “getting along in San Miguel” tips and tricks. Among them is the tried and true “avoid discussing politics”. It was followed by an extensive chart on the Bush crime family empire. And then, there are those of us who live well above Centro and have to look down, when we drive down the Caracol, on the horrifying brown of the diesel exhaust, brick kiln toxics settling in the bowl, pollution from the wood/plastic burning fireplaces. We wonder how many people in this Paradise die early, suffer lung disease/heart attacks from living in the City of Brown Smog, while they are busy worrying about “crime.” Braving this kind of pollution to come in for the occasional lecture, concert, treat, we are grateful to the monied expats who live in the sacrifice zone. 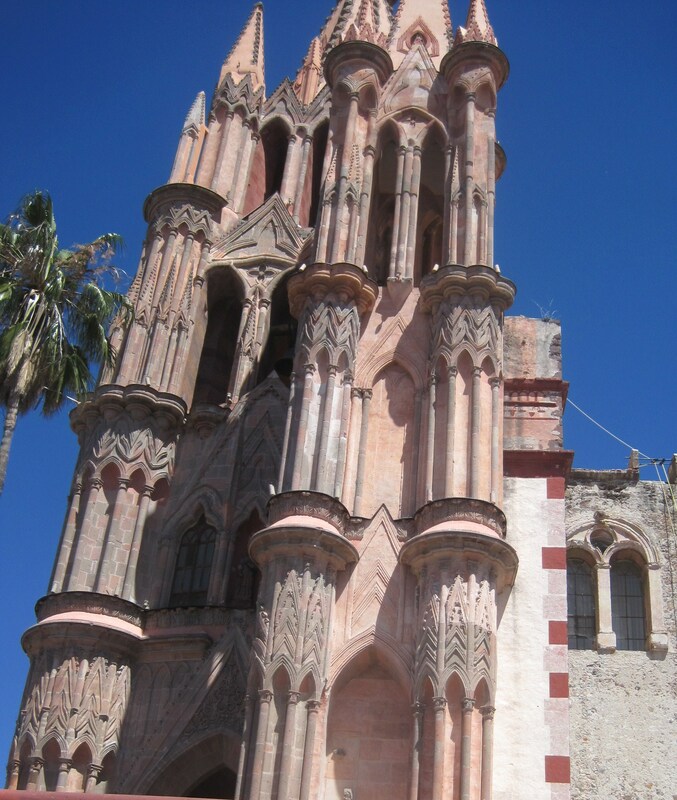 And what could be a more appropriate illustration of your sardonic wit than the epitome of façade — the false front of Cinderella-in-Mexico’s castle? There be dragons beyond the pale. Roving bands of Mexicans, nearly all of them dangerous, prowl all parts of Mexico, not just San Miguel de Allende, which lie beyond Centro. Food there is laced with shredded glass and ptomaine, your money will be swapped out for false currencies, and you will sold into white slavery. And that’s why those who don’t live in Centro lie about it. They may claim that the lines of Centro encompassing their abodes were actually drawn by Alfonso Allende, Ignatio’s brother, extending halfway to Malanquin Club de Golf and that the current pitiful nucleus is something dreamed up by gringo real estate titans. Another option, a far better one, is not to live in San Miguel at all. Perhaps yet another line (color to be determined later) could be painted even farther out from centro, farther even than those outlying areas you mention, that could indicate clearly the point at which one leaves San Miguel altogether and actually enters the nation of Mexico. I believe you are now living outside Centro.m but then, I may be wrong.